If you’ve got more than a passing interest in mountain biking then the chances are you’ve heard of the Megavalanche. It’s one of the sport’s most iconic events – and the sight of hundreds of riders enthusiastically hurling themselves down an Alpine glacier makes compelling footage. The race starts at 3,300m on the Pic Blanc glacier above Alpe d’Huez in the French Alps, plummeting to the valley floor 2,000m below in Allemont – via 30km of snow, ice, rocks, roots, switchbacks and singletrack. I’d previously declined the opportunity to take on this MTB “rite of passage”, but 2013’s race co-incided almost exactly with my 40th birthday – an omen that seemed too significant to ignore. Yes, I did pack a bit too much stuff. I was giddy at finally owning my own van. After booking on the day entries opened, the members of the (unofficial) Mackerel and Laphroaig Racing team rolled into Alpe d’Huez seven months later to discover that we were all at the front of our respective qualification rounds. No pressure then. Getting there half a week before the racing began was supposed to give us time to check out the trails and get used to riding at altitude – but in reality it gave me the opportunity to crash my bike repeatedly and leave myself with a collection of minor injuries. There were a few tricky sections on the qualifier course – including a wooden drop which I managed to land badly and go over the bars – breaking my fall (and helmet) on a conveniently placed rock. And the next day when checking out the main course I managed another big off. My front wheel dropped into a slushy hole at the bottom of a snowy chute and I managed to land chest-first on a hefty boulder – winding myself so badly that I thought I’d cracked a rib. I had a day off after that. To be honest I’d underestimated the event a touch – and the testosterone-soaked atmosphere was a contrast to our usual bike holiday fun. Also, there was (anecdotally) around three times as much snow at the top as usual – making for very hard going. The qualifier race is by no means a formality at the Mega. Those who do well in it get a place in one of the three mass-start races, while the slowcoaches have to be content with riding down individually against the clock. The track was shorter, steeper and rougher than the main race – so, like many others, I was using a full-on downhill race bike (in my case the very fast Mondraker Summum). I somehow ended up on the right-hand edge of the front row, and as the tape went up and my caffeine gel kicked in I gave it my best sprint and was on the pace by the time the first corner came into view. The track narrowed slightly here, with a wall of hard snow to my right – and I edged to the left, just as another rider began to loom into my peripheral vision from behind. Neither of us gave way and we both went down in a tangle of handlebars. Initially I could overtake fairly easily, with my 8in of suspension gobbling up the high Alpine terrain, but then the trail turned to rocky singletrack and the next 10 minutes were frustrating – with only a few opportunities to take a steeper line and nip ahead of those on less-capable bikes. By the halfway point we were on a smoother trail and my heavy bike had become a bit of a liability as the gradient eased off. All I could do from here to the end was attempt to hold my position and hope my legs would keep turning. A few riders sneaked past me but I was reasonably happy with my performance – mainly because I’d managed to make it into one of the mass-start races. I was in the third-tier race, which began mid-morning on the Sunday – and I made my way up the mountain via two cable cars (with massive queues) to join the 300-odd other contenders in the thin air atop the glacier. Queues are a given at the Mega. I’d had an awful night’s sleep with an unexpected attack of pre-race nerves, but I was feeling OK and there was an adrenaline surge as the event’s trademark Euro-techno played and the MC told us all what crazy motherflippers we were for being there. Or rather we weren’t. The front rows were long gone but it seemed to take minutes for the riders in front of me to begin moving across the start area and down onto a steeper section of ski piste. The bunching at the start may have been a good thing in hindsight, because it meant I had a slim chance of not ploughing straight into somebody else as soon as I let go of the brakes. Getting used to the handling of my bike in the snow, I gradually built up speed and began passing plenty of riders. I even caught up with my pal Pete – who had been nearer the front – and gave him a shout before promptly taking my first tumble of the day. The gradient was slackening now and I was pedaling through the slush, trying to follow tyre channels in the snow. I hadn’t been working this hard at such a high altitude before and I was shocked how quickly I was panting with my muscles aching in protest. How on earth was I going to survive the next hour? I didn’t have long to worry about that though, as I’d come to the steepest section of the course, where it turned off the ski piste and straight down the snow-covered mountain. Only a few brave souls were attempting to ride this – and most of them were falling off. 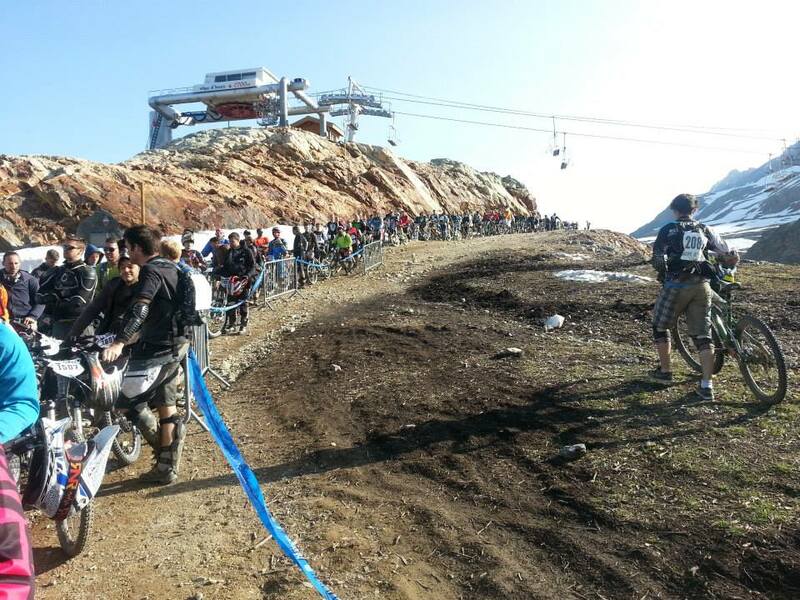 Instead the vast majority of riders were either walking down or sliding on their backsides with bikes on their laps. I took the latter option and covered ground quickly – with the only downside being that my shorts had filled up with icy slush. Not an experience I’m keen to repeat. As I plugged through the snow there were a few pinch points where riders bunched up, with most taking a typically French attitude to queuing – so those with the sharpest elbows got through first. After doing quite well at these, I was delighted to see the snow finally give way to a rocky trail ahead – and was getting my breath back now that the air wasn’t quite so thin. Overtaking was difficult as the track was narrow and hugged the hillside – so I just kept pace with the guy in front as I enjoyed the feeling of turning the pedals on solid ground again. I knew that if I could maintain position for now then I’d have a good chance of making up places in the woods lower down – where I’d been overtaking plenty of riders on the rooty and steep terrain in practice. But just as I was starting to feel like I was getting back on top of the race, fate – or more precisely another rider – dealt me a cruel blow. The track briefly turned from rocky singletrack to grass and I took advantage of the smooth surface to put in some uninterrupted pedal strokes. But just as I was getting up to speed the rider behind came alongside and grabbed my handlebar, pushing it quickly forward so that my bike stopped dead and I went flying over the bars. Landing hard in a ball of dust and pain, I got back up as quickly as I could, determined not to lose too many places. However it quickly became clear that all was not well. I tried to lift my bike by the handlebar but one of my arms wasn’t co-operating. I couldn’t lift it from my body and it hurt like hell. It was obviously broken. So this is where that free helicopter ride comes into the story. Followed by a visit to a small clinic in AdH – where the bored medics took an eternity to break out the painkillers, before putting me in a fancy (and ridiculously expensive) sling and kicking me out with a prescription for co-codamol. So what happened next? Did I track down the SOB responsible? Were the gendarmes called in? Was I airlifted back to Blighty? Sorry but it’s a bit of an anti-climax. 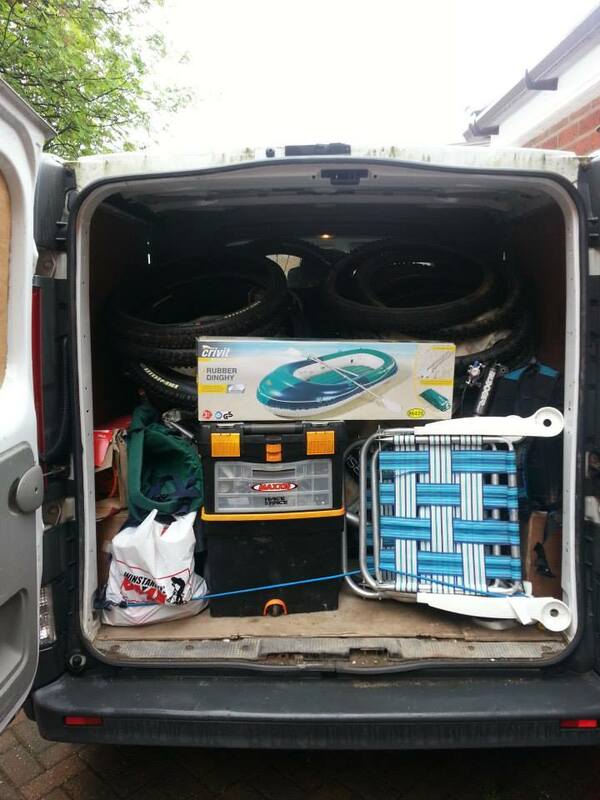 We were on a tight schedule to get back to our jobs in the UK and needed to hit the road that afternoon – and luckily my friend Adam was able to drive my van. Trying to identify the culprit once I got home, I was stonewalled by the race organisers and I decided to let it slide and focus on recovery – trusting karma to take care of things. It was going to be months before I could ride a bike again, but I couldn’t just go cold turkey so I bought a turbo trainer and set it up in the living room – pedaling away while watching the Tour de France on TV. Surprisingly, when I got back in the saddle for real in the autumn I seemed to be fitter than ever and I’d lost weight – inspiring me to push on and make much bigger gains over the past two years. Friends often ask if I’d do the Mega again – and I don’t even have to think about the answer. No f***ing way, but you should.